Durable one-part marine varnish dries to a UV-stable, gloss finish that accentuates the wood grain and improves clarity—even after multiple coats. Dries super fast, so you can apply up to 5 coats in a day, without sanding between coats. Low-odor, low-VOC formula cleans up with soap and water. Resealable, easy-pour pouch prevents messes and waste. Choose light amber gloss or clear gloss finish. Multiple coats of Halcyon provide the preferred, rich amber tone of a classic, marine spar varnish. 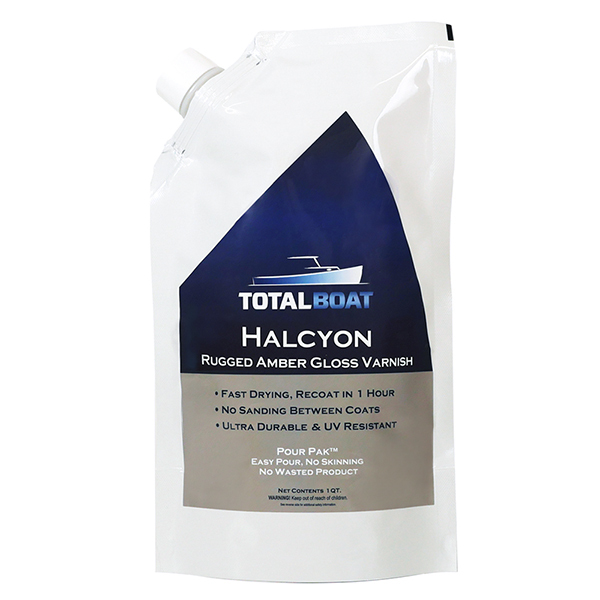 TotalBoat Halcyon marine gloss varnishes give you a choice on how to finish your brightwork or other marine woodwork: crystal clear, or with a slight amber tone. Both finishes accentuate the wood grain, and eliminate the cloudy haze associated with applying multiple coats of other wood finish products. Halcyon and Halcyon Clear also offer greater clarity, abrasion resistance, and UV protection than traditional marine varnishes. Compared to conventional varnish, TotalBoat Halcyon varnishes provide a fast application, faster drying times, and the fastest, easiest cleanup so you can finish varnishing your brightwork in a matter of hours. No more days and sometimes weeks of stripping off old varnish, coating, waiting hours for it to dry, sanding, recoating, more waiting, and more sanding until the gloss finish is truly finished. Halcyon adheres so strongly, and dries so quickly there’s not much time for the dust to settle. You can recoat in as little as 1 hour at 72°F. Finish faster, set sail sooner, and enjoy your boat and the compliments you’ll get on your beautiful, glossy brightwork. Halcyon means happy, which is what you’ll be while using it due to its low, low VOC content and no noxious fumes. You’ll be really happy when you see how easy it is to maintain the beauty with just 1 to 2 quick coats annually. When it comes to varnish coatings, hardness affects durability. TotalBoat Halcyon is very hard for a one-part varnish, and is made to last. It resists scratches and abrasion without yellowing, gloss loss, lifting, cracking, clouding, dead spots, and other issues commonly associated with conventional oil-based varnish. To develop an easy-to-use, eco-friendly marine varnish hard enough and UV stable enough to withstand assault from humans and harsh weather, flexible enough to move with wood as it expands and contracts with weather and use, fast drying to allow multiple coats (up to 5!) in one day, with very little odor, an extremely low VOC level that practically ensures compliance (always check local regulations, of course), and easy soap and water cleanup, we had to think so far outside the box, we ended up thinking outside the can, too, and put Halcyon in a resealable, airtight bag. This way, it won’t skin over while in storage, nothing gets wasted, and it’s always ready to use. With Halcyon’s ease of use and convenient packaging, glossy beautiful brightwork is truly in the bag. TotalBoat Halcyon’s advanced formula is simple to use and very forgiving, producing beautiful, consistent, level results with just a foam brush. It flows on easily and is much easier to work with than oil-based varnishes, synthetic marine wood finishes, and even other waterborne marine polyurethane finishes. Accelerated application: A maxiumum of 5 coats per day, if desired. Always wait 12 hours after applying Halcyon or Halcyon Clear, and before sanding.